Normally I look forward to rides but I have to confess my heart wasn't really in this one - certainly at the start. The day before, along with several other work colleagues I attended the funeral of another work colleagues 21 year old daughter. She had lost her very brave, almost year long battle against leukaemia. It was a very sad afternoon for many reasons. Seeing an entire family saying a dignified goodbye to their daughter with all the raw emotions that entails was not pleasant. The added element of seeing her contemporaries, all a similar age mourning the loss of a friend was as bad. Many of these young people I knew and had last seen when they were 11 - 12 years old. As I listened to the service I glanced around to see many faces I recognised and detected the tale-tell sign of young people confronted maybe for the first time with their own mortality. It was quite a poignant moment. So, I put my Brompton into my car and headed off to Charlbury station car park in the hope that a good ride would set me straight. I pumped up the tyres with a foot pump and noticed that the front tyre showed a lowly 65 psi. I pumped it up and went to investigate further. Finding a small 2cm long gash in the tyre wall I consulted those with superior knowledge and was told all would be okay. I half hoped that they would say, for you the ride is over. We set off and my worst fears were realised. My heart wasn't in this ride. I hung back and thoughts of turning round and abandoning the ride took over. By the time we had completed five miles I was ready to throw in the towel. Sentimental is not a word often associated with yours truly. When we stopped to regroup I was aloof, solitary and didn't really care about engaging in small talk with anyone. I was still dwelling - perhaps too much - on the events the day before. While still cycling - albeit very slowly - I telephoned Mrs Orange for a brief chat and spoke to my Orangettes. This was perhaps all I needed and gradually I started to enjoy the scenery, fine weather and the ride. As we cycled along we passed quaint little villages, complete with church almost trapped in time. The dry stone walls - such a common feature of the Cotswolds were also in abundance. The weather was really good. It was hard to believe that it was late September and it rendered the scenery to stunning hues. The Cotswolds are a part of the world I have a particular fondness for as I have driven the route from London to Ross on Wye countless times and spend part of every summer holiday there and thereabouts for the last 20 years. As we cycled on the ever reseouceful David spotted some hedges laden with blackberries. While we waited for the tail to catch us up many of us sampled quite a few. They tasted devine and were near perfection in terms of ripeness. The ride had quite a few downhill sections and I travelled as fast as I dared considering the state of my front tyre. On one short section of road, all the participants of the ride were bunched together. It reminded me of The Tour and the tight pelotons so often a feature of the race. The ride was billed as being for those who like hills. The ride was certainly not flat but it wasn't particularly hilly either. There wasn't a killer hill for all to attempt but it was a good 30+ mile ride that was demanding at times and one where you had to be on top of your gears. Out front David was as usual navigating the way. His Brompton was sporting a new rear wheel and is undergoing a makeover. Conversation was dominated by the new in thing, namely dynamo hubs. It seems that everyone and their uncle are getting one or thinking of getting one. The stop off point at just over 20 miles was a pub and sold pretty good food. I opted for a sausage and chutney ciabatta with skinny chips and it certainly hit the mark. With luncheon over we headed off for the remaining 10 miles or so. I took my Orange P type and again I really enjoyed riding it. 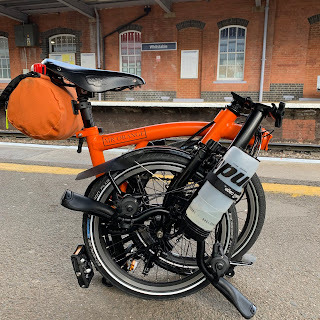 It is fast becoming my favourite Brompton and fast overtaking even my Titanium Orange Brompton - perhaps as it is the Brompton I use most often. I am fast wondering if I can truly justify a fair weather Brompton? Before long we reached Charlbury station car park where we started the ride. Our ride leaders were Rod and Dina were excellent hosts and a bespoke cupcake - which was perhaps meant for the end of the ride - was consumed with enthusiasm at the start. Many sensibly ate their one having completed the ride. Rob also gave up granola-type bars and brownies which were excellent. A very big thank you to Rob and Dina in particular and to David for his navigation up front. I really was quite awful company on this ride and I liken myself to the late Greta Garbo wanting to be alone. We all have these moments I suppose. Every year I make a charitable donation to a chosen charity. It isn't a huge one but I always do. 2015 will bring a few charity rides and I suspect I will quietly try to raise what I can for suitable leukaemia charities. By the time I was heading home I was feeling much better and my usual eternal optimistic self, which many find quite irritating, had returned. Once reunited with my family I was even happier. Next week there is another ride and I am looking forward to it greatly.